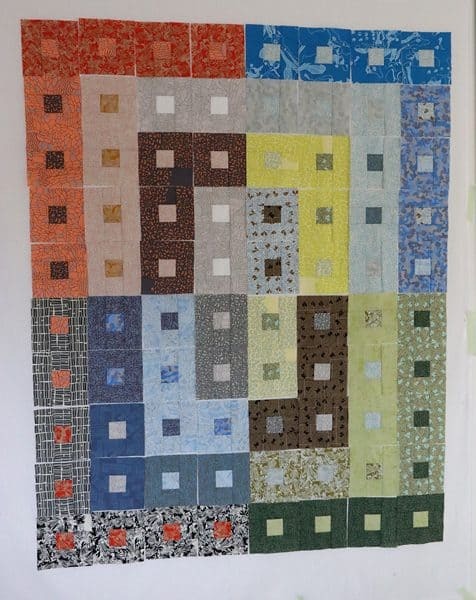 This is the second post about this log cabin quilt design – you can find Part 1 over here. After much ruminating about these Gleaned log cabin blocks, I finally have a finished quilt top to show you! But first, let me take you through the process. I want to show you that sometimes this quilt-sewing malarky isn’t easy. And sometimes, it can’t be rushed. In my last post I finished with the photo below, and also mentioned that I wasn’t happy with that layout. 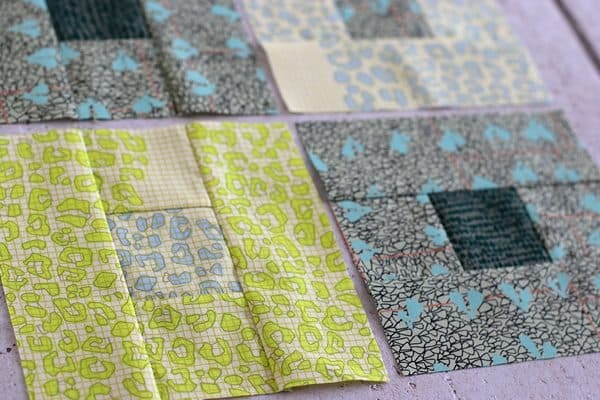 I was trying to get the colours to run diagonally across the quilt, roughly in the order they appear in the jelly roll. I really liked the way each fabric played nicely with its neighbour and wanted to preserve that aesthetic. I was liking this more, but it still wasn’t the right log cabin layout for me. Perhaps pulling each colour group into its own corner? I left this design (above) up on the wall for a few days. It was better than the previous versions but something about it was still bugging me. I started to get my usual mid-project feelings of despair – what are you doing? This is a terrible idea. How did you manage to take such a pretty jelly roll and make it so bleugh? This nasty little internal voice visits from time to time. Then I had a small realisation. 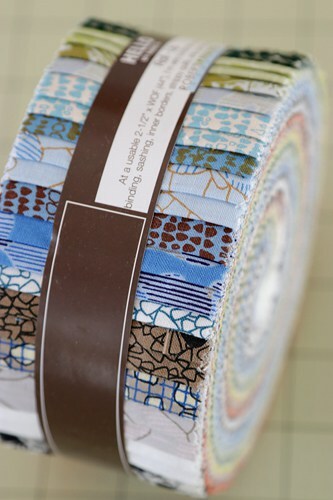 For some reason I had made the decision that I had to use the whole jelly roll and every single block I had sewed. Why I had put this limitation on myself, I don’t know, because I knew that some of the blocks were giving me trouble (see the tan, white and orange blocks boxed below). But was it done? Was this the final layout? I decided no. The overall design felt a bit too busy for me. I needed to create some restful space between all that colour so each fabric had a chance to be noticed. More white space was needed, I was sure of this. But how? 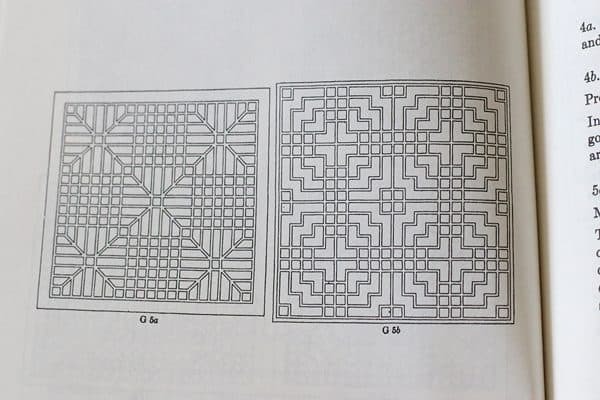 Then I remembered a book that I’d bought 6 years ago about Chinese Lattice Design*. 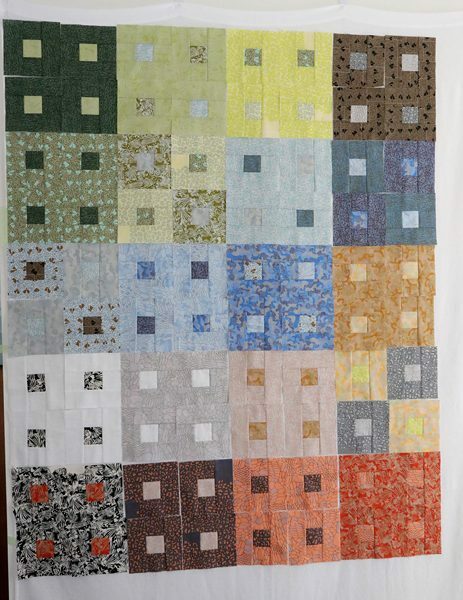 I spent an hour flicking through the pages and decided to try a lattice-style layout for this quilt. 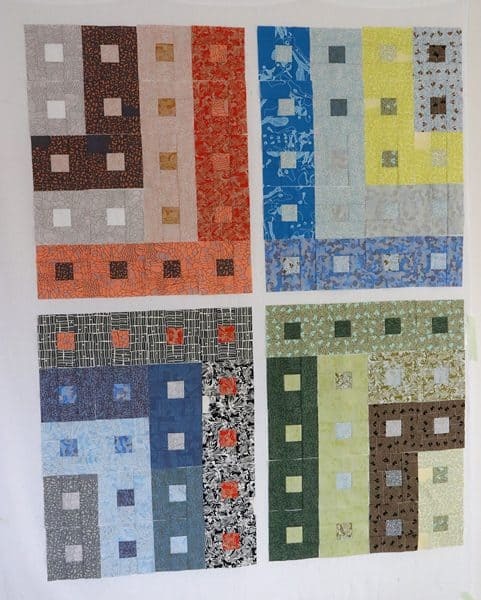 The exact layout I chose isn’t in the book, but you can certainly see that’s where the inspiration for this log cabin quilt design came from. I decided I preferred it with the extra white in the middle. To make all that sashing I used 3/4 yd of white fabric, cutting 16 strips 1-1/2″ wide. Then I sewed the halves together (with sashing in between) and finally the whole quilt together. 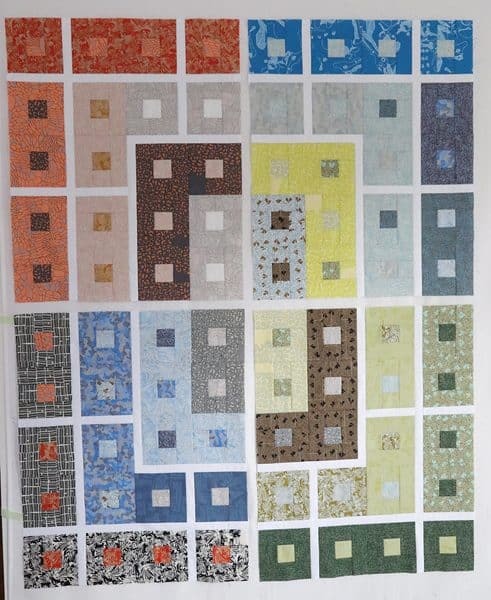 I think this would be a great quilt to make with plain 6-1/2″ squares instead of the log cabins, too. With a single fabric within each lattice compartment. 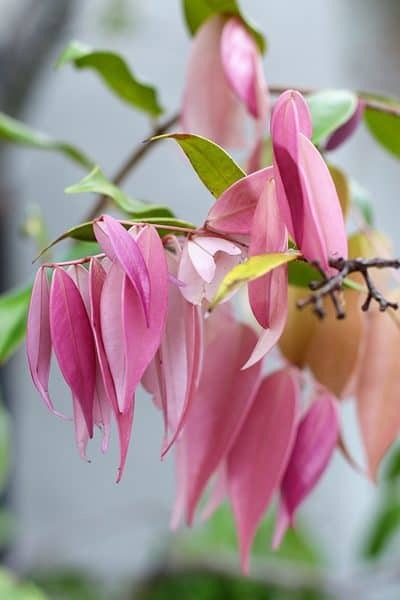 If the design doesn’t make you feel happy inside, let it rest a few days and see what solutions pop up. Your mind is very clever and creative, but sometimes it needs a bit of time to work through all the pieces. 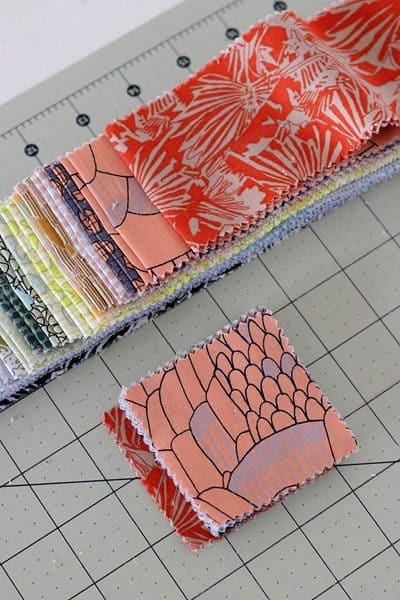 When trying to make a lot of patterned fabric work together, adding a solid (creating space between prints) can be helpful. 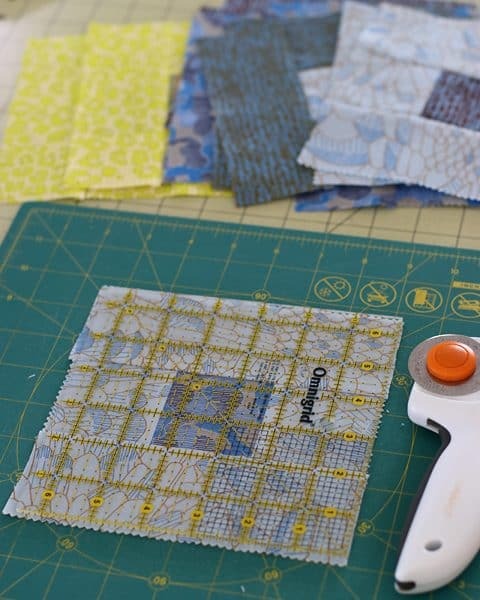 I hope some of this has been helpful for you, too – if only to show you that we all have struggles when quilting. Whatever you might be having trouble with on your sewing journey, don’t let it get you down. Don’t let it stop you creating. You’ll find the answer eventually. Sit down, grab a cuppa, this is a long one! Nothing dramatic, just one of those conversational posts with lots of photos that I feel compelled to write every now and then. 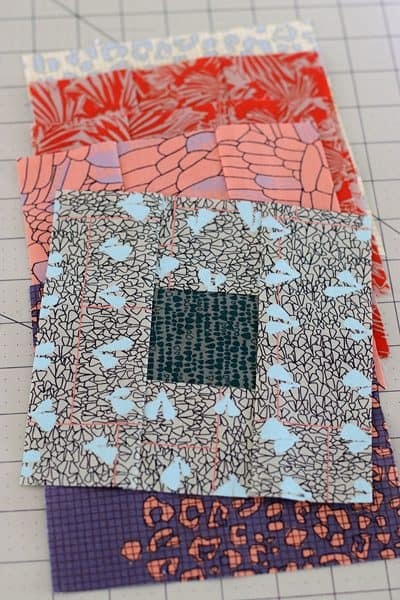 Back in November last year I picked up a jelly roll* (40 strips, 2.5″ wide) and two mini-charm packs (2.5″ square) of Carolyn Friedlander’s new line Gleaned. The colours are fresh and modern and play so well with all of Carolyn’s other lines (something I love about her fabrics). I also really love the botanical flavour of many of the prints, especially as I’ve just been reading the latest Uppercase book, which is full of beautiful blooms. And includes a spread on artist and fabric designer Bari J Ackerman! But I digress. Anyway, these pre-cuts sat on my (messy) sewing table for quite a bit while I considered what to do with them. 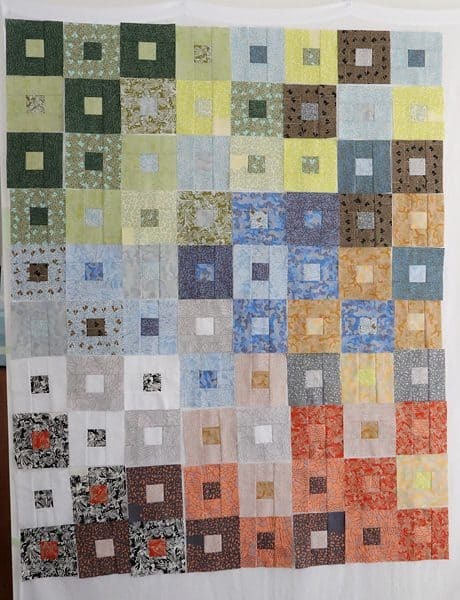 I circled back to log cabins blocks because they’re just so easy when using the 2.5″ strips from a roll. 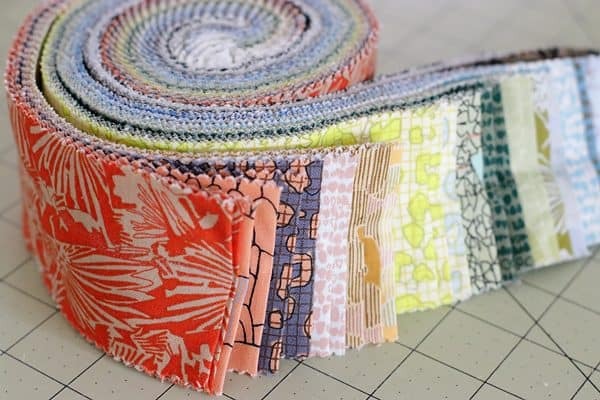 I really liked the colour order used to put the jelly roll together and wanted to keep the neighbouring colours together as “centres” and “logs”. When I unwrapped all the mini charms I just took the top colour off and popped it underneath the pile (see below). Then all the centres were one colour further along the colour order than the logs. I just sewed my log cabins from the two colours that were at the top of both piles. 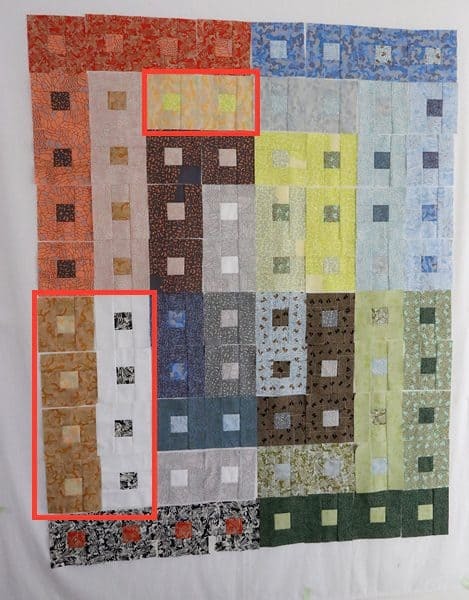 I found I could make two log cabin blocks from each fabric strip (using 2 x mini-charm squares). If you can’t find mini-charm packs, it’s easy enough to take a layer cake* (10″) and chop it into quarters (2.5″). Now, the strip roll and mini-charm packs didn’t have the exact same number of all the fabrics. In some cases I had more squares than strips for a colour combination, and occasionally more strips than squares. Not a problem, I just matched up the leftovers in pleasing colour combinations. From a 40 strip roll and 2 x mini-charm packs I made 80 log cabin blocks. I chain pieced them all with a scant quarter inch seam. My sewing machine ran hot that weekend. Sometimes it’s great to churn out a whole bunch of blocks really quickly. Then I trimmed all the blocks to 6.5″ square. Given I had 80 blocks, I decided on an 8 x 10 block layout. 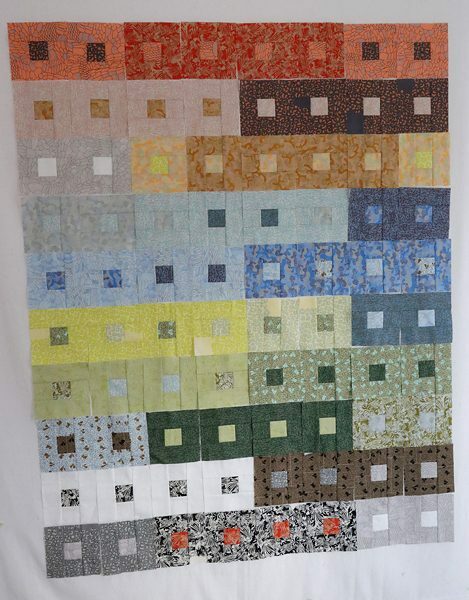 This would give a lap sized quilt (48″ x 60″). This was the first layout I tried. I was trying to keep the neighbouring colours from the strip roll together but I just wasn’t feeling the love. 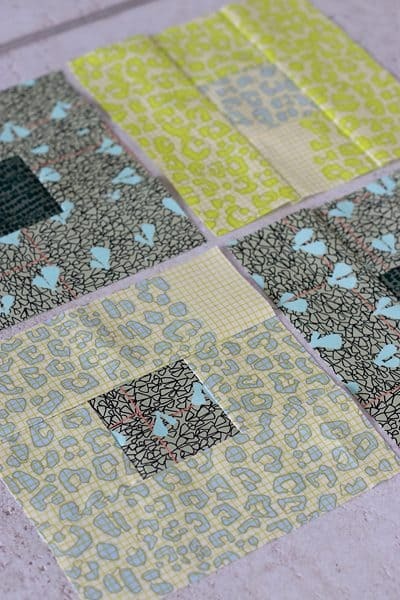 I continued on in this vein, trying move the colours across the quilt in the order I wanted. Sadly none of my arrangements were what I had pictured. It wasn’t helping that I’d had a bad day at work that day (I tend to feel uncreative on such days). I have a bunch more photos of other layouts, but I’ll save them for the next post, which you can find here. Hope you’re all having better luck with your creativity! 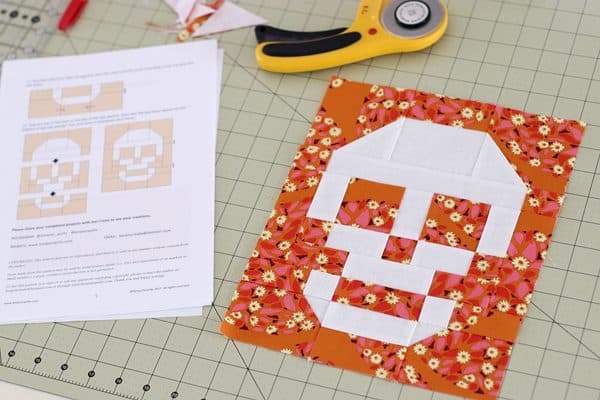 I’ve got a free Halloween patchwork block pattern for you! 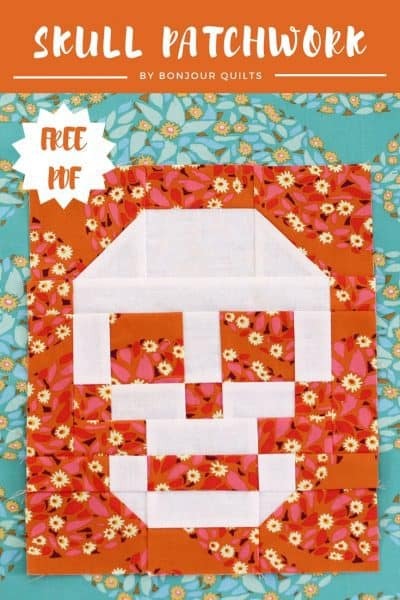 How about a skull patchwork block? It’s October – so it’s time to sew up all the spooooky projects you’ll no doubt find popping up all over Pinterest. 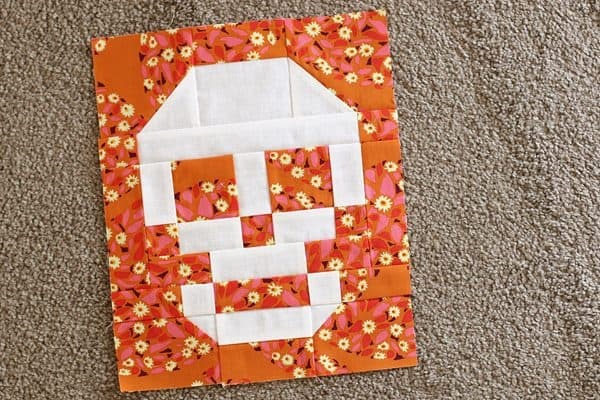 This pattern is for a 9″ x 11″ (finished) patchwork skull block. It would look great in a quartet for a cushion, or en masse in a Halloween lap quilt. I’ve made mine with an Anna Maria Horner floral background (no one does florals quite like her) to give it a bit of a Day of Dead vibe. This block is a good little scrap buster too. You can use up a fat-eighth in the background and a 10″ square for the bones. If you’d like to make your own, just pop your email address in below and I’ll send it to you. You’ll also be signed up for my newsletter which will let you know when all my free tutorials are published. Keep up to date with all my tutorials and patterns. Your email will be safe and never shared, and it's easy to unsubscribe at any time.